My name is Alvina On and I am a final-year PhD student in the Theoretical Astrophysics group in MSSL. In this post, I will blog about my experience in the XXV Winter School of Astrophysics on Cosmic Magnetic Fields. Last year saw the 150th anniversary of the first exchange of scholars between Japan and the UK. In the late stage of the Samurai period, five Japanese students, the ‘Choshu Five’, arrived at UCL, one of whome, Hirobumi Ito, later became the first prime minister of Japan. Since then, Japan and the UK have exchanged scholars and developed collaborative work across many fields including Science, Technology and Innovation. One of the fields in which we have a long history is astronomy and space science. These links were formed when the Royal Greenwich Observatory supported Makoto Hirayama for his studies in astronomy in 1890; later he became the director of the National Astronomical Observatory of Japan, helping smooth the way for his successors. Nowadays, our two countries have established a number of international projects which are aimed at solving frontier problems in astronomy and space science. ‘150 years of UK-Japan Collaboration: Science, Technology and Innovation Symposium – Astronomy & Space Science’ highlighted past, current and future collaboration in astronomy and space science, covering a wide range of research topics, from the Sun to cosmology. The symposium was a part of “The Japan-UK Science, Technology & Innovation Symposium” series. It was held at an interesting venue, the ballroom of the Embassy of Japan in the UK in London. The symposium began with opening remarks by Prof Len Culhane (former director of MSSL, UCL). In the first session, “the UK-Japan Space Science Mission”, we had 4 speakers summarising the space science mission in the UK and Japan, and our collaborations. Prof Grahame Blair (STFC) summarised the STFC’s support to astronomy and space science projects. Dr David Parker (CEO of UK Space Agency) showed a summary of the space science mission. He emphasized that cutting-edge sciences are supported by innovative technologies, for example the giga-pixel camera onboard European Space Agency (ESA)’s “Gaia” where MSSL made a major contribution. 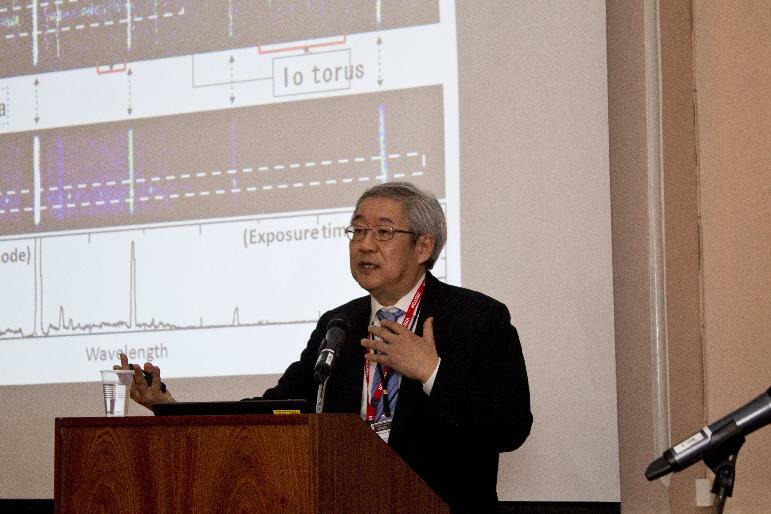 Prof Saku Tsuneta (Director of ISAS/JAXA) presented a comprehensive summary of Japanese space science projects. He stressed that the international collaborations are making Japanese space missions more successful and higher profile, and the successful UK-Japan collaborations should grow even more. Mr Atsushi Murakami (IHI Aerospace) gave a presentation about the Epsilon rocket. This session highlighted the exciting space science missions which are well supported by both British and Japanese governments, and the successful collaborations of the UK and Japan in the space mission. 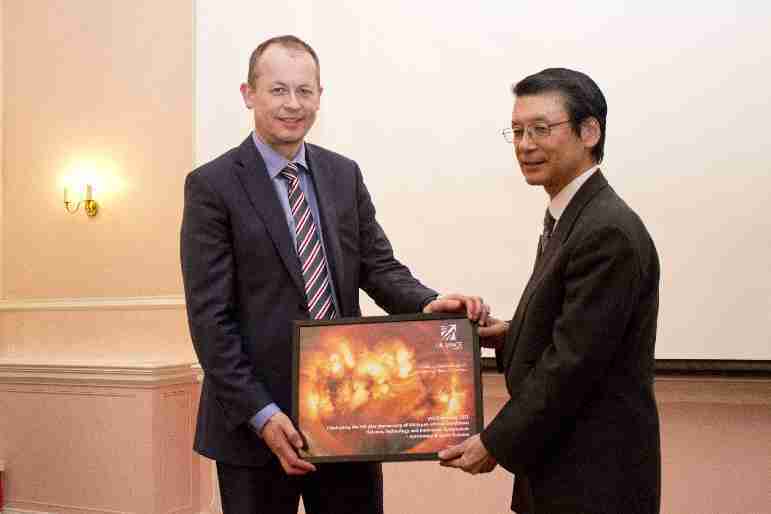 Dr David Parker gave a gift to the ambassador of Japan, Mr Keiichi Hayashi. In the next session, “Frontiers in Astronomy and Space Science: Highlighting the UK-Japan Collaborations”, we had 6 talks by the world-leading researchers who showed their cutting-edge researches in the way which non-specialist can understand. The ambassador of Japan kindly delivered his welcome speech before this session, and Dr David Parker gave a gift, Sun’s image taken by Hinode (Japan, UK, USA Solar mission), to the ambassador. Prof Louise Harra (MSSL, UCL) talked about Solar Physics, highlighting her fruitful collaboration with Japanese researchers through the Hinode mission. Prof Giovanna Tinetti (Physics & Astronomy, UCL) gave a talk about the exciting new discoveries of exoplanets, highlighting the results of Subaru telescope in Hawaii and big expectation to the Japan-led SPICA mission. Prof Chris Done (Durham) talked about Black Holes and Active Galactic Nuclei. She also highlighted successful collaboration with Japanese researchers through the Japanese X-ray missions, like GINGA, ASKA, SUZAKU and future Astro-H.
After a tea break, Dr Andrew Bunker (Oxford) talked about the galaxy formation, highlighting Subaru observations of the deep Universe which are revealing the pictures of baby galaxies. Prof Bob Nichol (Portsmouth) highlighted the UK-Japan collaborations through galaxy survey, such as Sloan Degital Sky Survey, SDSS. He highlighted the instrument development by Japanese team which was crucial for the huge success of SDSS. He also introduced ESA’s exciting new cosmology mission, Euclid, and highlighted the MSSL-lead development of the VIS instrument. The final talk was presented by Prof Hitoshi Murayama (UC Berkeley, Director of Kavli IPMU, University of Tokyo) who gave a fascinating presentation about dark matter that is the dominant matter in the Universe, but not yet discovered. He introduced exciting new instrument of Subaru, Hyper-Suprime-Cam (HSC), and a planned next-generation instrument for Subaru, PFS (Prime Focus Spectrograph). He also highlighted successful international collaboration in cosmology and particle physics. 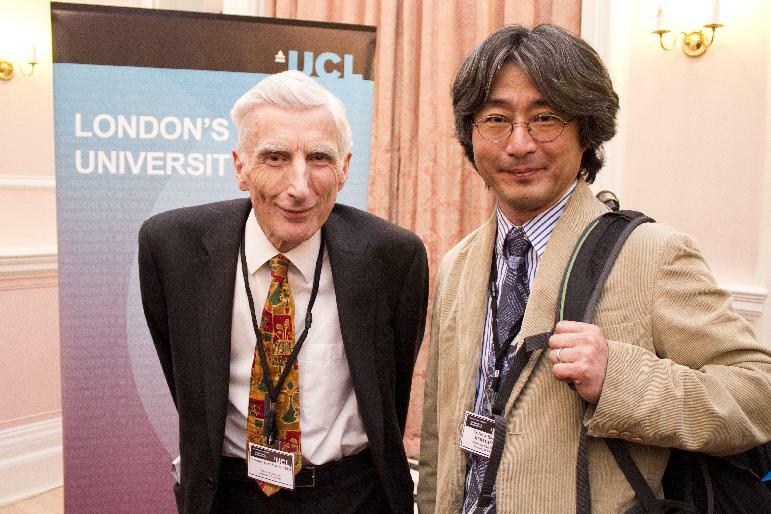 Finally, Lord Martin Rees (Cambridge) delivered his inspiring concluding remarks. Then, all the participants enjoyed the reception with wine, champaign and the yummy Japanese food. We had about 190 participants who were staff of governmental organization, staff and students at the academic institutions, not only from astronomy and space science, but also from various disciplines, and general public. We have received a number of positive feedbacks from the participants who told us that the symposium was successful and enjoyable. I thank very much the many people who came to the symposium, to the great speakers, organisers, and the staff of the Embassy of Japan and MSSL, who kindly supported the symposium. The programme of the symposium and copies of all the presentations can be seen at the symposium website. We could see from the symposium that the active collaborations between the two countries in various area of astronomy and space science are developing further, and we have many exciting future projects to explore the Universe together! This week we have a post by Paul Kuin (Swift UVOT team at MSSL), taking us through the breathtaking roller-coaster ride of discovery as the light from a supernova in the nearby M82 galaxy was observed. 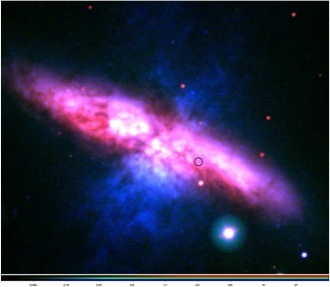 You probably heard by now about the new supernova which was discovered in the M82 galaxy. I thought it would be nice to write about our involvement here at MSSL, and give some background story. The first I heard about the supernova was through an Astronomical Telegram (ATEL for short) sent Wednesday the 22nd of January by Y. Cao of Caltech and collaborators who took a spectrum and identified this as a Type Ia supernova at 14 days before the peak brightness. I thought that was interesting news. We don’t see many type Ia supernovae in galaxies so nearby. The last one was SN 2011fe, which was seen in M101, the pinwheel galaxy. The supernova was discovered by our colleague Steve Fossey and his students here at UCL. I checked the Swift TOO list (a TOO is a Target Of Opportunity, requested for interesting, unexpected astrophysical events) and saw that Eran Ofek requested a Swift observation, which already had been approved. Mark Cropper (MSSL) sent an email around alerting everyone in the lab of the discovery, and I responded that Swift was already on it, observing. Ignacio Ferreras then (MSSL) asked for more information. 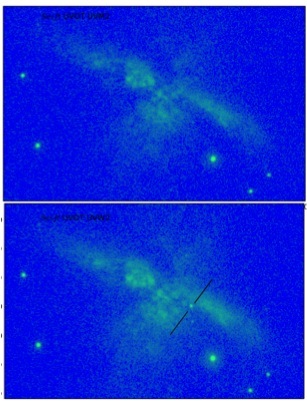 His student Susan Hutton (MSSL) had made a study of M82 using very deep Swift UVOT images that had just been accepted for publication! One of their data consists of sums of images in the UVOT ultraviolet filters, revealing fainter features than before. I contacted Mike Siegel, head of the Swift UVOT team at Pennsylvania State University, who told me Peter Brown of Texas A&M was taking the lead for our team. Peter was in the process of submitting more TOOs for Swift observations in the six UVOT filters, and with the Swift ultraviolet grism (to take a spectrum of the supernova). We decided on some details via email. A colour image of M82 with brightness in UVOT UVW2 in blue (10ks); UVOT UVW1 in green (8.7ks) and SDSS-g in red, with the position where the supernova was found as a circle. This image was taken before the supernova explosion. In the meantime the first data had come down from Ofek’s TOO. Swift data are public and available on a quick-look site. The supernova was bright in the optical V, B, and U bands. It was also visible, though fainter, in the UVW1 band which is a filter bluewards of the U band, centered at a wavelength around 252nm, in the near-ultraviolet region (invisible to the eye!). However, the UVM2 and UVW1 bands which are at even shorter wavelengths were not yet available. Typically, during the early stages of the explosion, the supernova has a very hot expanding photosphere. The expansion increases the brightness while the temperature goes down, but the initial temperatures are very high, putting out much of the emission in the ultraviolet. 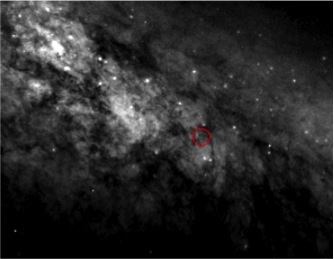 Therefore the observed faintness of the supernova in M82 in the UVW1 filter is not typical. The most likely reason for such faint UV emission is the large amount of dust that photons have to traverse to leave the dusty galaxy (which is orientated edge-on towards us). Ignacio had in the meantime plotted the position of the new supernova on his deep image, and on a Hubble ACS optical image with better spatial resolution. I had wondered if there would be any evidence of a progenitor, but nothing special was spotted (a type II supernova would have originated from a very luminous supergiant star, whereas the progenitors of type Ia explosions are much harder to detect, consisting of a binary system, where at least one of the stars is a white dwarf). A bit later we saw other ATELs come by where others did report their searches (ATELs 5789,5794,5795). The greyscale image is from HST/ACS (8.1 ks in F555W), zoomed in towards the area around the new supernova. This image was taken before the supernova was discovered. I checked a few times, but the grism observations were not yet in the Swift list of “observations done”. By the evening we got the observation in UVW2, which showed the supernova, and later in UVM2 which did not (see the blue images below; the SN position is indicated in the uvw2 image with lines). The UVW2 filter peaks farthest in the ultraviolet of all the UVOT filters, but also has a small sensitivity bump around 420nm of about 0.4% of the peak response, also known as a “red leak”. However, the UVM2 filter response is limited to a small wavelength band around 225nm only. The first conclusion was that the contrast in brightness between the optical and ultraviolet was so large that the UVW2 detection of the supernova was probably due to the high flux of optical photons seeping through the red leak. Note that the UVW2 image was taken first, before the UVM2 one. The next morning the grism observation was partially available on the Swift quicklook web site. I downloaded the data, and had a look at the first two images. There was a bright zeroth order in line with the spectrum, but it seemed in the wrong place. After getting the published position plotted on the image I was sure. There sat another very bright star right in the same dispersion plane as the supernova. What was going on!? The grism disperses light into colours, and so spectra of two nearby sources in a grism image can fall over each other, and that is precisely what happened here ! It can be fixed by changing the roll angle of the spacecraft, so I quickly alerted the on-duty scientist that there was a problem. At the daily Swift planning teleconference there was some futher discussion of that issue. Since there was not much time left for the next plan upload to the spacecraft, we worked hard to resolve which angle to use for the next day. Mike Siegel was eventually asked for help and we decided on a new spacecraft roll angle. However, even the early contaminated UVOT spectrum clearly showed that there was not much emission below 290nm, since that area of the spectrum was partially uncontaminated. The next day I got an email that NASA was going to put out a press release, and that Neil Gehrels, the Swift Project Scientist, thought that Swift should put out an ATEL with our results so far. We decided to ask Peter Brown at Texas A&M to write that. He had already done a lot of the work for that, including making some images of before and after. He also could say, based on the latest data, that there finally was a detection in UVM2. The supernova had either brightened enough, or we had accumulated enough exposure time to get a detection. He also worked with the NASA press people, and soon there was a lot on Twitter with his ATEL and NASA’s press release taken up by many outlets. By Sunday the 26th of January, 2014, I had downloaded one of the new grism images and extracted the spectrum (plotted above). 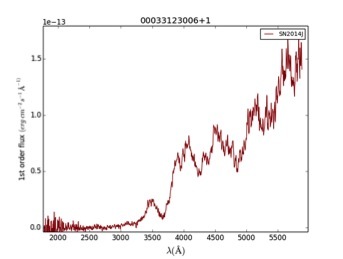 It shows the characteristic undulations due to a plethora of spectral lines from metals formed and expelled in the SN explosion (we had a blog entry in 2013 on how spectroscopy allows us to understand the composition of galaxies). It can be seen that the flux drops off quite steeply to the blue. It will be interesting to see if summing exposures will make the spectrum in the UV visible, and what signatures there are of the absorbing material in the UV. Hopefully we will learn something from this nearby supernova Ia that helps us understand them better.